Hairline International Hair and Skin Clinic launch Tele-Dermatology which includes Cosmetology and Trichology for the first time in the country. The introduction of Tele-dermatology will now facilitate the practice of dermatology online with the help of unique software that will connect both the patient and the doctor, irrespective of physical distances that separate them. This unique service is the first-of–its-kind in the country and is poised to make immense impact in the field, considering that it offers real time diagnoses and consultation on both non-surgical and surgical conditions. The company in partnership with DocPulse has developed a software that enables patients from any corner of the country to consult with doctors and experts realtime online without actually having to walk in the clinics. The software has been developed on a Google platform for hazzle free un-interrupted online sessions. 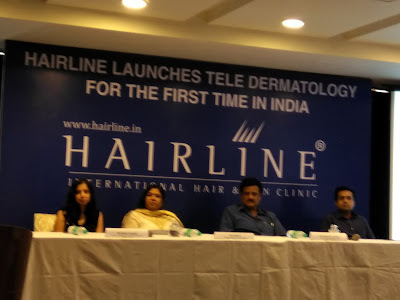 Speaking on the benefits of tele-dermatology in cosmetology, Dr. Kala Vimal, Dermatologist and Cosmetologist, Hairline International Hair and Skin Clinic says, “The primary benefit of such technology is the easy access to dermatologists and cosmetologists for those seeking an opinion on skin conditions, related investigations and diagnoses with treatment options. The ability to reach out to the most remote areas is a benefit. It is especially useful in the case of immobile patients, for whom coming to a hospital is a difficult task. This system may be used to diagnose acne and acne scars, pigmentary conditions, wrinkles, photo-aging, sagging skin, hirsutism, stretch marks and much more. In fact, diagnoses methods go a step further with Hairline International offering Skin DNA investigative options where the patient will be sent video tutorials on taking a swab for a DNA test. This is to be sent back to the specialists at Hairline International who will provide a detailed report, based on which treatment methods are prescribed”. Dr. Dinesh Gowda, Dermatosurgeon, Hairline International Hair and Skin Clinic enumerate on the benefits of tele-dermatology in Trichology and say, “Trichology is a highly specialized field with doctors, especially surgeons being largely present and confined to metros. This technology assesses the line of treatment required by a patient of hair loss, based on its intensity. Options available may be surgical and non-surgical. Pre-surgical counselling for all possible treatment forms may be provided during interaction. Post-surgical care may also be carried out on an interactive basis over multiple sessions. For patients that require surgical treatment, Hairline will provide end to end packages covering travel, accommodation, procedures, medicines and post treatment consultations”. Bani Anand, Founder and Managing Director, Hairline International Hair and Skin Clinic says, “We have always believed in bringing the best and latest in technology into our diagnoses and treatment options. Tele-dermatology ensures that expert medical opinion can be made available to all people, irrespective of where they are located. This works to the benefit of the patients not only in Karnataka, but across the country and internationally as well. With the specialized medical personnel on board and the latest in equipment that Hairline possesses, we are well equipped to manage patients coming in from around the country and the globe”.